We feel happy when we are helped by someone, and we also feel happy when we help someone. We （feel） happy｜when we （are） helped <by> someone,｜and we also （feel） happy｜when we （help） someone. We all know you can sing very well, but that doesn't mean you can say anything. 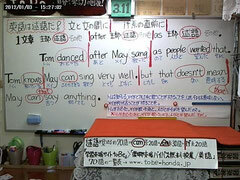 問１　We all （know）｜you （can） sing very well,｜but that （doesn't） mean｜you （can） say anything. People in Japan may think anyone on the Earth can get enough water to drink and use almost anywhere, but in other countries there are people who cannot drink and use water　when they want to do so. 問５　People <in> Japan （may） think｜anyone <on> the Earth （can） get enough water to drink and use almost anywhere,｜but <in> other countries there （are） people who cannot drink and use water｜when they （want） to do so.